A scientist watches the supply plane depart from Slawek Tulaczyk’s field camp on the ice sheet. 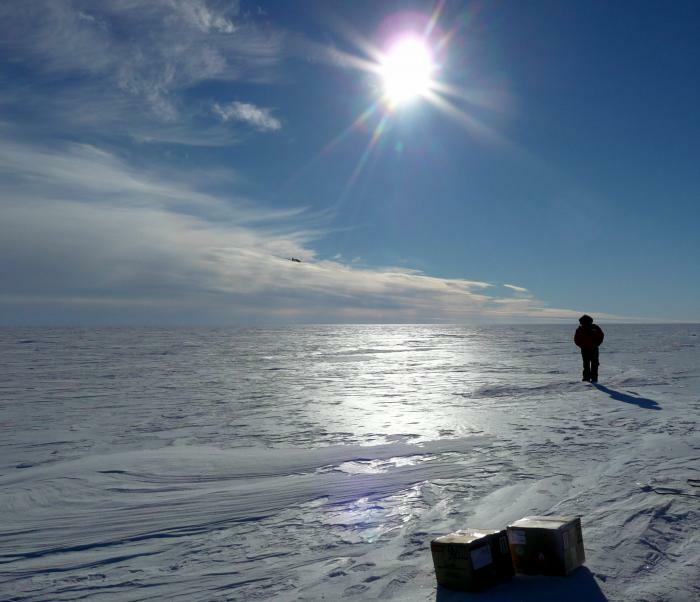 Glaciologist and professor Slawek Tulaczyk and graduate student Jake Walter from the University of California, Santa Cruz, and undergraduate student Saffia Hossainzadeh from the University of Chicago work in the fast-evolving world of ice-sheet dynamics. They were joined by a British collaborator, Professor John Woodward from Northumbria University in Newcastle. 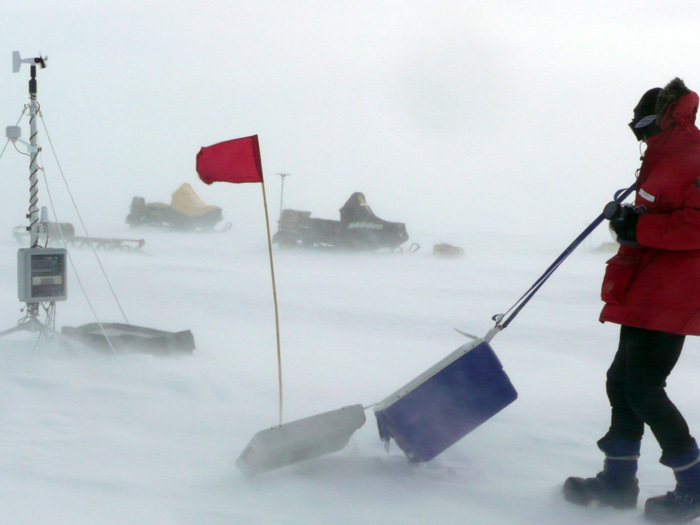 A storm sweeps across the West Antarctic Ice Sheet, partially burying parts of Slawek’s field camp. 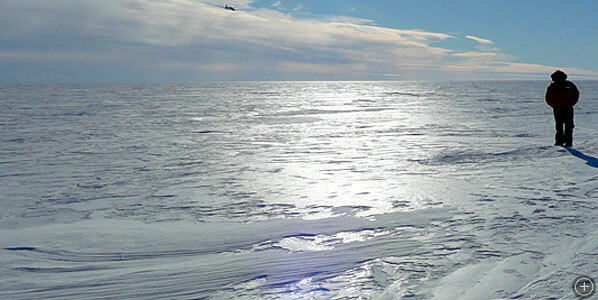 Understanding how large polar ice sheets behave in a warming world is an important but relatively unknown factor that may dramatically affect sea level and other consequences of climate change. Until recently, ice sheets and glaciers were thought of as vast reservoirs of frozen water, shrinking during warm seasons and growing during cold ones, and slowly moving toward the ocean and breaking off icebergs under the force of gravity. Scientists are just starting to understand how dynamic these giant slabs of ice really are, moving up to 5 feet (1.5 m) a day, energized by a series of flooding and draining lakes and streams at their base. 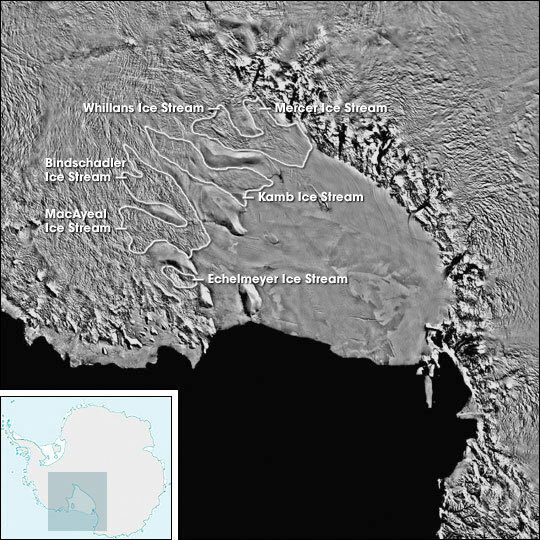 In November 2008, Slawek’s team investigated two lakes, Lake Mercer and Lake Whillans, located under the vast West Antarctic Ice Sheet (WAIS). They traveled to each of their study sites by snowmobile, set up camp, and began a laborious and explosive process known as “active seismic imaging.” This is a common and time-tested technique, employed by geologists during the 1957–1958 International Geophysical Year, to image layers of ice, water, and sediment using sound waves generated by detonating dynamite. Sounds simple, but it requires serious labor and extreme care. For each survey, Slawek’s team drilled a 65-foot (20-m) borehole through the top layer of snow and dropped in an explosive charge. Stepping back, they detonated the dynamite and used a string of listening devices, called geophones, to capture the sound waves reflecting off the ice layers, lake surface, and lake bottom. 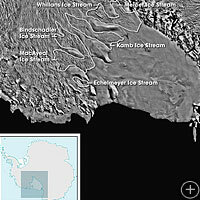 This created a detailed image, similar to an X-ray picture, of the inside of the ice sheet and underlying lake and rock layers. 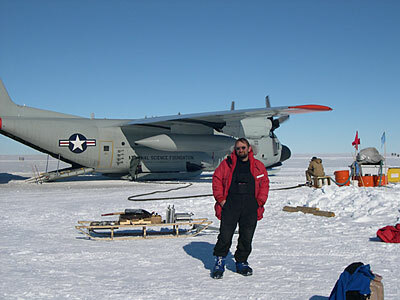 Slawek Tulaczyk in front of an LC-130 Hercules transport plane.